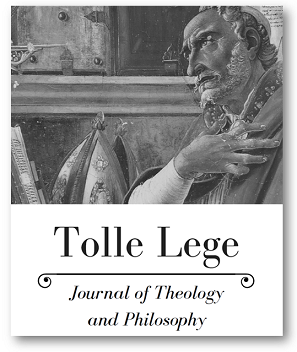 Tolle Lege is a student journal of theology and philosophy published annually, at the end of the fall semester. Essays written by any student of the university on any topic in theology or philosophy are considered for publication, though preference is given to undergraduates. The journal is staffed by a team of Mount students, who, assisted by two faculty advisors, have complete control over the editorial process, including the selection of essays to be published. Our aim is to publish the very best philosophical and theological writing done by Mount students each year, thereby exemplifying and promoting the Mount's mission to foster "liberal learning in the pursuit of truth." The journal takes both its name and its inspiration from St. Augustine, in whose thought theology and philosophy are merged in a unified search for truth. Manuscripts on any topic in theology or philosophy will be considered for publication. Submissions will be accepted from any student currently enrolled at Mount St. Mary's University, although preference will be given to undergraduate students. Manuscripts should be at least 1000 words long. Manuscripts of any length over that minimum limit will be considered. Manuscripts must be submitted electronically by attaching a Microsoft Word document to an e-mail message and sending it to tolle.lege@msmary.edu. Please deliver all submissions by May 20.